We know that Gor, or Counter-Earth, is not stable in a long-term sense. Let's handwave that away, or assume that we are dealing with a temporary span of time in which the instability is immaterial. Mid-20th to early 21st century Gor and Earth have finally discovered each other and made contact. An alliance of nations on Gor have succeeded in building a space station in Low Gor Orbit (LGO) and are very interested in starting regular passenger/cargo shuttle flights to Earth's International Space Station. What trajectory would a more-or-less contemporary crewed spaceship use to travel between Earth and Counter-Earth? We are dealing with civilizations that are, technologically, more or less anywhere between Earth's mid 20th century and a few decades from now. That is, incremental advances in technology (e.g. slightly more accurate thrusters, 10% more effective radiation shielding, or tastier meals-in-a-pill) are fine, but no Stargates or Millenium Falcons. The trip should be as short as reasonably possible, but should keep the persons on board reasonably safe. Spaceman Thumper reminds you that if you fly directly into the Sun, you are going to have a bad time. I'm imagining that ships would simply drop into an elliptical orbit that would put them onto a trajectory to intercept the other Earth, but what would that look like? Would such an orbit be quick and reasonably achievable, or are our hypothetical cross-world pioneers going to be wandering around the Solar System like Odysseus? 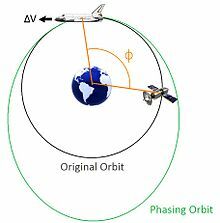 In astrodynamics, orbit phasing is the adjustment of the time-position of spacecraft along its orbit, usually described as adjusting the orbiting spacecraft's true anomaly. 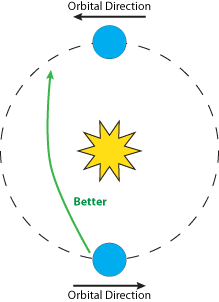 Orbital phasing is primarily used in scenarios where a spacecraft in a given orbit must be moved to a different location within the same orbit. You have two points in the same orbit and you're trying to transfer from one to the other. Normally this procedure applies to objects in Earth orbits and hence the phase angle refers to the position of the object relative to Earth and the Sun. 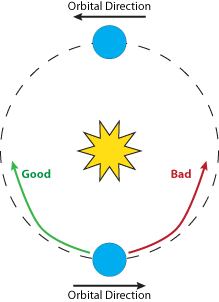 In this case you're looking at the Solar orbit but the principle is the same. If you want to go backwards, you accelerate. If you want to go forwards, you decelerate. Yes, the opposite of what you'd first think. The principle is that by decelerating you put yourself into a smaller, faster orbit and hence increase your phase angle faster. By accelerating you put yourself into a larger slower orbit and the point behind you catches up. These kinds of questions are fun. The preferred path will always be counter-orbit. I don't want to move forward toward Gor because it's moving away from me and that will lengthen the mission. We want to move backward, so Gor is approaching us as we approach Gor. In this case we have the most fuel efficient solution because all we need is to get the ship out of our atmosphere. If all it did was sit there with a relative velocity of zero, 180 days later it would collide with Gor. However, cheap as it may be, time is money! We need a faster solution, but preferrably one that doesn't cost us a mint. Trivially, we can give our space ship constant thrust. We can leave it on the same path — the planetary orbital path — and reduce the number of days waiting by the allowed thrust period. OK, it's fast. But we can do better. We're using contemporary technology, the cost-vs-time trade-off (which always exists) is basically the size of the boosters + the capability of the onboard engines vs. how long we're willing to wait to get the job done. Frankly, we're basically in the hands of newtonian physics anyway — but that includes the sun! If we pull the flight path closer to the sun, we actually get a boost from the sun (both in terms of acceleration and deceleration), which speeds us up without additional cost, and shortens the path. Let's use some real data to ship some cargo. Humans will be slower because, well, we hate being squished. Therefore, let's use New Horizons as our benchmark. It left the Earth at a screaming 16.26 Km/s and passed the moon's orbit in just 8.5 hours. Smokin'! But the moon's a kicked can compared to Gor. Now, here's where I'm very happy you didn't include the hard-science tag. I stink at orbital mechanics. I'm slowly working through a textbook on it, but I'm not to the point I can just pull the math out of my head. Not by a long shot. But, here's the gist. We're working with a sphere (a sphere described by the orbits of Earth & Gor) and there's a reason we fly over the pole here on Earth. But remember that our launch point and destination are both on the "equator" of that sphere. therefore, the sphere actually buys us little if anything at all. We have an initial velocity that's fixed at 16.26 Km/s. However, we'll speed up as we approach the sun. We want to get as close to the sun as our heat shields and (and this is important) the oribit of Gor will allow. That minimizes the time of transit. We do need to miss Venus and Mercury. They're not particularly in the way, but there are certain times of the year where they might (I stress, might) be inconvenient. However, we can always lift the path of the ship on the sphere such that it flys over or under the inner planets and avoids them completely — so they're really not much of a threat. What would be the actual shortest path given all of the above? Well, you need the circumference of the orbit (940x106 Km) and you need the effect of the Sun's gravity (274 m/s2) and you need our reference intial velocity (V0 = 16.26 Km/s) and then [magic happens here]. What can I say. I'm not to that point in the book, yet. If HDE 226868 or Kingledion answer, be sure to upvote them. They are initiates of the inner circle and know the correct incantations and which Demon to invoke to provide an actual, numerical answer. The travel time is dependent on your $\Delta v$ budget. More $\Delta v$, the quicker you go. The bare minimum (least fuel costly) you can do is a $\Delta v$ burn arbitrarily close to Earth's escape velocity (about $11.2 km/s$) where you could slowly inch ahead of the Earth on a slightly faster orbit until you reached the L3 Lagrange point (the position of Gor), where you would perform a near-zero $\Delta v$ burn to slow to a stop relative to Gor. This approach necessitates very, very long travel times, which we do not want, yet, it is the most fuel efficient. This approach also gets you at L3, but you could just as easily carry the fuel instead to inject into a circular orbit around Gor (for LEO, a $\Delta v$ of $3.4 km/s$). This trajectory would take you $38,700,000 km$ from the Sun, still a greater distance from the Sun than Mercury, so you probably don't have to worry about the whole solar atmosphere thing. However, $18.3 km/s$ is quite a lot of $\Delta v$. For perspective, the multi-stage Saturn V had a total $\Delta v$ of about $17.9 km/s$ (if launched from rest in empty space). Not the answer you're looking for? Browse other questions tagged planets space-travel orbital-mechanics modern-age counter-earth or ask your own question. What are the possibilities of a dwarf planet orbiting opposite Earth's orbit? If there was a Counter-Earth on the other side of the Sun, when would it have been discovered? What goods would be worth trading between Earth and Mars? Duplicate Earth and Moon, where should I put it? How technological advanced a civilization would need to be to prove the existance of the shadow Earth?